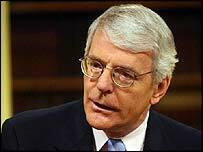 Former Tory prime minister John Major has received England's highest award for chivalry - the Order of the Garter. The 62-year-old former Huntingdon MP becomes a Knight of the Garter - an honour given personally by the Queen - and will be known as Sir John. He said: "I am absolutely thrilled, honoured and delighted." Sir Winston Churchill's daughter, Lady Soames, 82, and former Lord Chief Justice of England and Wales Lord Bingham, 71, also enter the order. The official ceremony will take place at Windsor Castle in June. There are 25 full members of the order, including the Queen. She chooses the other 24 members, known as Knights and Ladies Companions, without the advice of ministers. Other members of the royal family and foreign monarchs are often made less senior members of the order - known as either Royal Knights and Ladies, or Stranger Knights and Ladies. Former prime ministers are usually made members of the order soon after their retirement from office. The order already includes Baroness Thatcher and Sir Edward Heath, two other former Conservative prime ministers. Indirectly it was the death of former Labour premier Lord Callaghan that created the space for Sir John to receive his honour. In recent years two other members - Lord Longford and the Duke of Devonshire - have also died. New members of the order are traditionally announced on St George's Day. Before the order's June procession at Windsor Castle, the new members will receive a ceremonial garter and the garter star - the badge of the order. Sir John, who is currently in the US on business, succeeded Baroness Thatcher as prime minister in 1990 and held office until 1997, when New Labour came to power. His wife Norma is already Lady Major, having received a damehood in her own right six years ago for services to the mental-health charity, Mencap. Lord Bingham was made a Life Peer in 1996. 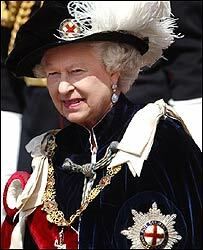 Lady Soames adds her latest honour to the damehood she received in 1980. Her appointment marks the first non-royal father-and-daughter appointments in the Garter's 650-year history. Edward III established the order in 1348 - making it Europe's oldest national award for chivalry in continuous existence. Scotland's equivalent, the Most Ancient and Most Noble Order of the Thistle, was set up in 1687. In 1783 an Irish equivalent, the Most Illustrious Order of St Patrick, was founded. It has lapsed since Irish independence.